Foldable dish drainer is a perfect solution for space limited areas. Made from solid material and equipped with draining holes for fast drying. 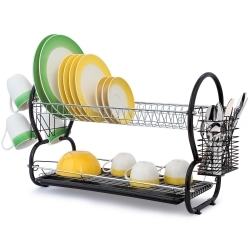 You can easily accommodate plates, cups, cutlery and other kitchen utensils in this dish drainer rack. After usage fold the drainer and store it where you like. Absolutely essential for camping and caravanning — easy to clean and keep.